The Image Color Web Part is a SharePoint client side web part built with the SharePoint Framework (SPFx). 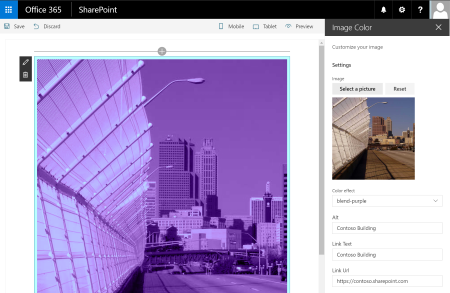 With this Web Part, you can choose a picture from SharePoint librairies, and select a color effect to automatically applied on it. You can choose between a large amount of color effects. This WP uses only CSS customization to modify the picture thanks to the colofilter. This web part uses also the Custom Fields library to enhance the web part edition experience.